Early Root Development and Its Relation to Transplanting.--When tomato plants are grown from seed, they develop a strong taproot which, under favorable conditions for growth, may reach a depth of 22 inches in 3 weeks. This growth has a rate of 1 inch a day. 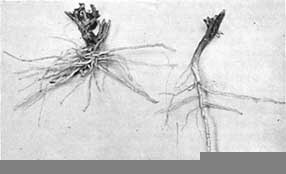 On plants of the John Baer variety, the taproots were uniformly branched to within 2 inches of the tip. The rate of branching in the first 6 inches was 10 to 12 laterals per inch; at greater depths the number varied from 6 to 8 per inch. At this time the plants were approximately 4 inches tall and had about 4 leaves each. It is clear that such plants could be set into the field only with difficulty. Hence the practice of transplanting one or more times before the plants are finally set into the field. Transplanting or potting of seedlings tends to modify the natural taproot system into a more or less fibrous one, due to the injury to the taproot. 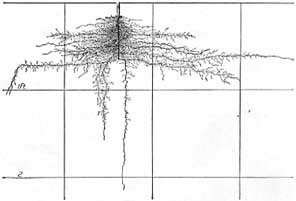 The change in the root system is really very profound (Fig. 70). Much time is saved by setting out well-grown plants rather than, starting the crop in the field from seed. A desirable plant for setting in the field is 6 to 8 or even 10 to 12 inches tall, with thick, tough stem, plenty of dark-green leaves, the crown bud developed, and a large fibrous root system which will enable it to stand transplanting 7,121,120 (Fig. 71). Tomato seedlings of the John Baer variety were transplanted to the garden May 16. They were set 4 feet apart and the stems were allowed to grow on the ground without pruning. On June 11, the time of the first excavation, the plants were 8 to 12 inches tall and had, on an average, 10 compound leaves. The leaves, of 5 to 13 leaflets, were about 5 inches long and presented a transpiring surface of 94 square inches. The stem of the plant at the ground line was more than ¼ inch in diameter. The tomato was characterized by a taproot which tapered gradually from a width of 10 to 13 millimeters near the soil surface to only 2 millimeters at a depth of 6 inches. As a result of transplanting the taproots, if unbroken at this depth, were usually curved sidewise or even upward. On plants where the taproot was sharply curved often several large laterals arose either from the point where the curving occurred or directly above it. In fact this phenomenon of root branching has been repeatedly observed on numerous species of plants both cultivated and native. Usually one of the main roots penetrated quite vertically downward and a maximum depth of 2 feet was reached. 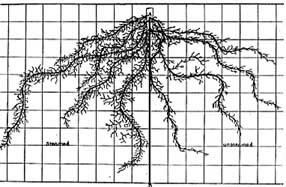 Although profuse branching occurred in the surface soil at depths greater than 2 inches, below 8 to 10 inches the thread-like main root was poorly branched (Fig. 72). Usually 4 to 6 short branches (none over 1.5 inches long) per inch of root arose. The last 4 to 7 inches of the glistening white, fairly tough, main, vertical roots were unbranched. Fig. 72.--Root system of John Baer tomato about 4 weeks after transplanting into the field. In the surface soil, usually below 2 inches, roots arose in great profusion. The adventitious root system, i.e., roots arising from the buried stem, was making a vigorous growth. In the seedling stage the young roots grow out from the stem in distinct vertical rows which correspond with the position of the fibrovascular bundles within the stem. But after the plant becomes larger and older they arise from all sections of the stem below the soil surface. From 18 to 33 laterals clothed each inch of taproot. Like the adventitious roots, nearly all of these took a horizontal course. Although most of them were only 1 inch or less in length, many were 0 to 9 inches long. Thus the surface soil for nearly 1 foot on all sides of the plant was thoroughly ramified with rootlets. Even beyond, to a maximum distance of 2 feet, larger laterals were found. A few had reached their greatest spread from the taproot and started to turn downward. Only rarely did a root pursue a downward course in proximity to the taproot. In regard to branching, laterals were profuse. Usually, however, branches were short (2 to 5 millimeters) until the roots had extended 2 to 4 inches from the taproot. Thereafter they ranged in length from 0.3 to 2 inches and usually occurred at the rate of 5 to 10 branches per inch. Occasionally branches 4 to 6 inches in length were found. Many of these thread-like laterals were quite profusely rebranched with short sublaterals. These glistening white, rather tough, fibrous roots and their branches were, at this stage of development, almost or quite confined to the surface 2 to 10 inches of soil. It was here that the plant was getting its abundant supply of water and nutrients for rapid growth. Later Growth.--A second examination was made 1 month later, July 11. The plants now had an average height of 19 inches, a spread of tops of about 2 feet, and each was furnished with 6 to 11 branches. The average total leaf surface at this time was approximately 12 square feet. The plants were blooming profusely and had also developed a few green fruits, the largest scarcely exceeding 1.5 inches in diameter. The stem was 0.8 inch in diameter near the soil surface and tapered slowly to a rather stubby root end of the enlarged portion at 6 inches in depth, the taproot having been broken in transplanting. As at the earlier examination, the prominent part of the root system consisted of very abundant laterals. Many of these had now extended outward to 2 or more feet, mostly in the surface 9 inches of soil. Then turning obliquely downward, they had reached depths of 3 to more than 3.5 feet. The soil beneath the plant was fairly well occupied with other laterals which turned rather obliquely downward without spreading, and with long branches from the more horizontally spreading ones (Fig. 73). Fig. 73.--Tomato on July 11. It is 1 month older than that shown in Fig. 72. The number of laterals was very large. For example, one plant had 16 small laterals in the first inch of soil; there were 41 small branches and 3 large ones (1 millimeter or more in thickness) in the second inch; 30 small laterals in the third inch; 19 small and 5 large roots (1 to 5 millimeters in diameter) in the fourth inch; 24 small and 5 large branch roots in the fifth inch; 16 small ones in the sixth inch; none in the seventh; and 6 small ones in the eighth inch of soil. At greater depths there arose 3 to 8 small laterals per inch of taproot. The young and short rootlets in the surface inch were poorly branched. But branches occurred in great numbers on all of the deeper ones. Very frequently the larger roots gave rise to branches 6 to 24 inches in length, and, in fact, some were as long as the main laterals. These branched again, thus greatly extending the absorbing area. Laterals only 0.3 to 2 inches in length, and frequently furnished with sublaterals, were common almost throughout the entire extent of larger roots. Although they varied in number, 4 to 8 per inch (but sometimes 15) were common. Below 2.5 feet the branches were shorter and frequently less abundant on these younger portions of the roots. The last few inches of the rapidly growing roots were free from branches. A working depth of about 3 feet and a maximum penetration of 49 inches were found. The rather tough roots were of a light-tan color except the youngest portions which were white. Summarizing, the root system of a tomato plant of average size filled the soil on all sides of the plant to 2 to 2.5 feet and to a depth of over 3 feet. Thus more than 65 cubic feet of soil were already ramified and the roots were rapidly extending downward into new territory. Maturing Plants.--By Aug. 13 the well-developed plants had a top diameter of about 4 feet. The number of leaves varied from 400 to nearly 500 per plant. The leaf surface exposed to water loss was very large. A plant, for example, with only 294 leaves had a leaf surface of 69 square feet (Fig. 74). The plants bore fruit abundantly. Fig. 74.--A fully grown tomato plant with a surface area of 69 square feet. A very extensive root system is necessary to supply sufficient water and nutrients for such a large top. Roots arose in great numbers from the base of the stems. About half of them were only 1 to 4 inches long and unbranched. Larger ones were furnished with 5 to 7 short branches per inch throughout their older portions. Perhaps the general root habit may best be visualized by a study of the behavior of some typical major laterals. One of these, arising at a depth of 3 inches, grew away from the base of the plant to a distance of 3 feet, where at a depth of 11 inches it turned rather vertically downward and penetrated to a depth of 45 inches. From a diameter of 6 millimeters at its origin it tapered to 2.5 millimeters at the 2.5-foot level but it maintained a diameter of 1 millimeter to its end. At 5 inches depth it gave rise to two large branches, which ran parallel in their downward course, finally reaching the 4-foot level. Another primary lateral, also originating at a depth of about 3 inches, forked dichotomously when 5 inches from the taproot. One branch descended nearly vertically to 4 feet; the other ran rather horizontally 3.5 feet in the surface foot of soil and, then turning downward, also penetrated to the 4-foot level. During its horizontal course the latter gave rise to 11 large branches which were found to extend to depths of 3 to 4 feet. One of the largest primary branches, 7 millimeters thick, originated at a depth of only 4 inches. It ran horizontally 20 inches where it branched into 3 equal parts. All pursued a horizontal course. The first forked again at 52 inches from the base of the plant, one branch turning downward immediately, the other extending 1 foot farther before entering the deeper soil. The second, after pursuing a devious course in the surface foot of soil through a distance of 8.5 feet, was 5.5 feet from the taproot when it turned downward and penetrated to 4.5 feet. The third had a very similar course. When it is stated that a single plant of average size possessed 15 to 20 branches somewhat similar to those described and almost countless smaller ones, the really enormous absorbing area of the tomato begins to be apparent. Moreover, branching was very profuse throughout. Branches occurring at the rate of 8 to 10 per inch of rootlet were common. These varied from unbranched laterals 0.5 inch or less in length to branches 2 feet long and rebranched to the fourth order. Sometimes the ultimate branchlets were 0.3 to 1 inch in length. Even a single, main lateral forking and reforking, giving rise to branch after branch, most of which were long and penetrated deeply and all clothed with an intricately branched network of rootlets, furnished an enormous absorbing area. Even the roots at the working level (42 inches) and in fact to near the maximum depth (52 inches) were exceedingly well branched. In addition, numerous roots arose from many of the prostrate branches even at 6 to 8 inches from the taproot. Dense clusters of roots 6 to 12 inches long were furnished with 12 to 20 rootlets per inch. Thus a soil volume with a surface area of at least 80 square feet and a depth of 3.5 feet--280 cubic feet of soil--was thoroughly ramified. Many roots extended more widely (maximum, 5.5 feet) and some even penetrated more deeply. Summary.--Tomato plants are started in especially prepared seed beds, transplanted once or twice, and then set into the field. The strong taproot, which may develop at the rate of 1 inch per day, is injured and a dense fibrous root system promoted by transplanting. 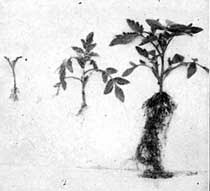 Plants of the John Baer variety, scarcely 1 month in the field, reach a depth of 2 feet and a maximum lateral spread of 24 inches. Most of the exceedingly numerous, much-branched, horizontal laterals occur between 2 and 10 inches in depth. The adventitious root system develops rapidly but the surface soil is still free from rootlets. A month later when the top has a transpiring surface of 12 square feet, the roots are very extensive. Many of the strong laterals, all of which arise in the surface 10 inches of soil, spread horizontally 2 or more feet and, then turning downward, penetrate into the third and fourth foot of soil. Others pursue a horizontal course throughout, ending 3 feet or more from the base of the plant. Still others run obliquely downward, usually one strong root assuming the rôle of a taproot. The main roots often give rise to very long laterals which also penetrate deeply. All of the roots are extremely well branched, and the 2 feet of soil on all sides of the plant are well filled with roots to the 3-foot level. The adventitious root system thoroughly ramifies the surface soil. Mature plants have a transpiring surface of 70 to 100 square feet and a wonderfully extensive root system. Usually 15 to 20 major branches spread widely (maximum, 5.5 feet), have very numerous large branches, which usually penetrate deeply, and finally, turning downward, extend into the third, fourth, and sometimes the fifth foot of soil. In addition there are almost countless smaller main laterals. All are so profusely furnished with masses of much rebranched rootlets that the absorbing area is extremely intricate and extensive even beyond the working level of 3.5 feet. A very large soil volume, beginning just beneath the soil surface, is very completely ramified with rootlets. Other Investigations on Tomatoes.--A tomato plant was examined at Geneva, N.Y., Aug. 13. The greater part of the roots appeared to extend horizontally and were about 8 inches below the surface. The horizontal roots were traced to a distance of 24 to 30 inches from the base of the plant. Observations on the growth of tomato plants have also been made in Germany. 89 In the main, plants were grown in containers but the root systems of plants growing in the open were also washed from the soil. The taproot, at first quite distinct, became, at greater depths, so delicate that it was difficult to distinguish it from the mass of laterals. The adventitious root system developed relatively early. The branches pursued a horizontal or oblique course and were branched much like the main root. Plants only 8 inches tall had a depth of 4 feet. The roots grew at the rate of over 1.2 inches per day. Some were 5 feet long. They had developed branches to the third order. The rate of branching was profuse. For example, in an area 41 by 13 inches 1,427 rootlets were found. The root system of the tomato studied rather thoroughly occupied a cubic volume of soil slightly over 4 feet in each dimension. In every case the number of roots of second, third, and fourth orders growing in the steamed soil exceeded the number in the check soil. In one instance there was an increase of 160 per cent. It was further ascertained that between the ages of 47 and 78 days the increase in the number of roots is almost entirely in the third and fourth orders, few roots of the second order being produced in this period. As maturity and fruitage approached, the root system made no further significant growth. Why the tops of plants grown in steamed soil are larger is now clear. The finer and smaller roots, clothed with root hairs, furnish the absorbing surface for the plant. This part of the root system is greatly increased by steaming the soil. Steaming the soil makes more plant nutrients available. It has the same effect upon vegetative growth as the addition of well-rotted manure and the effect is provisionally attributed to some of the organic products of decomposition effected by the steam. 128 It also brings about changes in texture, moisture content, and movement of water. Perhaps the manurial effect is the most important factor but all may aid in producing a more fibrous, more extensive, and hence more efficient root system. 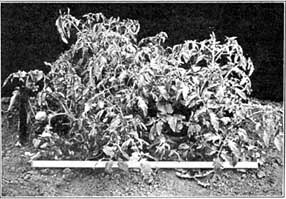 Experiments on Root Distribution, Cultivation, and Water Conservation.--Tomatoes of the John Baer variety were grown in 1926 to determine the effect of deep tillage on root distribution and its relation to water and nitrate content of the soil. The plants were grown in two plats of which the rows (five in each plat) were 40 feet in length and 4 feet apart. When transplanted on May 3, they were set 4 feet distant in the rows. These plats, which adjoined those of the cabbage (see Chapter XI), were given exactly the same treatment as the cabbage in regard to cultivation, i.e., one was hoed 3.5 inches deep and the surface of the other was scraped. The uncropped area between the cabbage plats was used as the check. The root system was examined on June 19. It agreed in every way with those already described. The tomato had more roots in the surface 3 inches of soil than the cabbage. More roots per plant (below 3.5 inches) were found on the tomatoes in the deeply hoed plat. Where the roots had been cut as a result of hoeing, the remaining portion, of the root developed more branches throughout, but especially from near the injured root end (Fig. 76). Fig. 76.--Representative surface roots of tomato under two types of cultivation. The upper root shows normal development in the surface soil layer. The lower one has been cut by deep cultivation. This resulted in a great increase in branching. Scale in inches. Late in July it was found that the roots extended to within 0.5 inch of the soil surface just beneath the base of the plants in both plats. Otherwise in the scraped plat the roots often penetrated to within 1 to 1.5 inches of the surface but the deeply hoed plats only rarely had roots in the surface 3.5 inches of soil. It was found that roots of the plants adjacent to the uncropped area between the plats, which was 10 feet wide, extended almost across it so that even the center of this area was drawn upon for water and nutrients. An examination of Table 16 shows that, notwithstanding the dry season, on this lowland area there was sufficient moisture available for growth, a fact substantiated by the excellent development of the plants. The amount of water in the uncropped area in excess of that of the cropped one, otherwise similarly treated, ranged from 0 to 3 per cent until the roots became extensive. After July 2 differences were much greater, often 4 to 8 per cent. The moisture relations in the deeply hoed and uncropped plats were, after the roots became widely spread, 2 to 7 per cent more favorable in the uncropped area. The excess moisture in the deeply hoed over the scraped plat was consistently greater in the surface 6 inches after June 25, and often 2 to 5 per cent higher. At greater depths differences were also rather consistently in favor of the deeply cultivated plats. These differences may be due in part to the loose soil retarding water loss directly from the surface and perhaps largely, in the surface 3½ inches, to little absorption from this soil layer. A survey of the available nitrates (Table 17) shows that the uncropped area (with one exception) had the largest supply, differences being found to a depth of 24 inches toward midsummer when the root systems were well developed. The nitrate supply was, with one exception, less in the surface scraped than in the deeply hoed plats. Thus the deeply cultivated plat was not only more moist but richer in nitric nitrogen. It has been shown that nitrate production in soils at Lincoln is insignificant at a moisture content as low as the hygroscopic coefficient 130 but increases with an increase in the moisture content. In some cases it reaches a maximum at a relative soil saturation of 60 per cent. No differences could be seen in the development of the plants in the two plats. Because of the dry season and a severe case of blossom-end rot yields were not determined. Similar experiments with tomatoes at Ithaca, N. Y., showed that the crop responded to cultivation which was more than simply to kill the weeds. Yields, however, were only slightly in favor of the cultivated over the scraped plat. 152, 158 A six-year average, however, showed no significant increase in yield due to cultivation as compared with scraping to keep down weeds. Here, as in so many phases of vegetable production, more experimental evidence under different climatic conditions is needed. 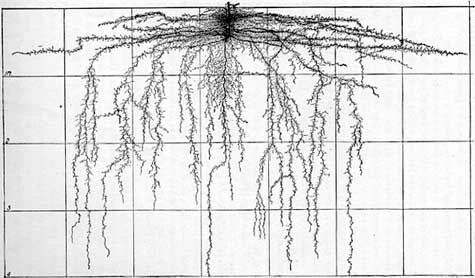 Root Habits in Relation to Cultural Practice.--The extensive and vigorous root system and its thorough occupancy of a large volume of soil helps to explain why tomatoes are successfully grown on all types of well-drained soil. It is indeed among the least exacting of the vegetable crops. In considering the relation of roots to soil, attention should be directed to the nutrient, water, and air relations of the substratum. Plants are directly dependent on these for growth rather than on any certain proportions of silt, clay, and sand. A soil with a good supply of humus, thus affording a fairly open structure, moderately rich in nutrients and one that is well drained and warms readily and yet retains sufficient water to insure a constant supply during drought, would seem ideal for the best root development. For quick growth and rapid maturity a lighter soil is preferable and perhaps a heavier one for the late-maturing crop. Transplanting.--Since the tomato plant is tender and cannot be grown in the field until danger of frost is passed, the crop is grown from plants started in greenhouses, hotbeds, or cold frames. The greatest yields and profits are obtained from well-grown, early set plants. 70, 5 The relation of the root system to transplanting is an important one. Usually the seedlings are transplanted when they are about 2 inches high and more space given each. In this process the roots are more or less severely pruned and the new root system is much more fibrous. Frequently a second transplanting is made in which each plant is given still more room or transplanted in a suitable receptacle such as a flowerpot, paper band, tin can, etc. Those not transplanted yielded more than those once transplanted, while those twice transplanted yielded least. The total for 10 plants with each treatment during a 3-year period was, 1,175, 1,131, and 1,001 pounds, respectively. Fortunately the tomato is a plant that well withstands transplanting compared to many vegetable crops (see Chapter XI, "Cabbage"). Suberization and resulting loss of absorption by the older roots slowly take place; there is a very high degree of root branching; and the proportion of actual root area to tops is very large. This accounts for the fact that plants even 10 to 12 weeks old that have been provided with sufficient room to make a steady growth may be profitably transplanted providing the root system is not seriously disturbed. For a week or 10 days before transplanting to the field, the plants should be hardened. This is accomplished by leaving the hotbeds open and adding only enough water to keep the plants from wilting very badly. In transplanting it is the practice to lift the plants with most or all of the roots and to leave as much soil as possible on the roots. When the plants have been grown in the cold frame, blocking is practiced to get as much of the root system and soil as possible. The blocking is usually done about 10 days before the plants are lifted. This early blocking cuts the long roots and promotes the development of lateral roots which ramify the soil block and hold the soil more tenaciously. This facilitates handling and lessens checking of growth due to the operation of transplanting. 70 Unless a moist ball of earth clings to the roots, a condition promoted by watering a few hours before transplanting, they are sometimes dipped into a paste made of clay and water. This keeps the roots from drying out and also brings them in close contact with the soil after transplanting. They are thus better able to withstand the check of transplanting into the field. The practice of transplanting on a cloudy day or late in the afternoon is a good one since at such times transpiration is less and sufficient water may be absorbed even by a more or less disturbed root system to supply the needs of the plant. Transplanting into a moist soil or watering the plant after transplanting promotes the same end. The soil, however, should not be too wet or puddled since this destroys its tilth and retards root aeration. Dry soil placed about the freshly watered plant prevents the surface from drying and forming a crust. Setting the plants several inches deeper in the soil than they were in the seed bed or container is beneficial since the plant will stand up better and the new roots will develop along the stem. The taller the plants the deeper they should be set. This promotes the growth of a larger and more deeply penetrating root system than where the plants are shallowly set. Experiments in which the plants were set only as deeply as they had been growing in pots resulted in later fruit production, a smaller total yield, and fewer and smaller fruits. Deep planting also holds the plant erect and rigid and reduces injury from strong winds shortly after transplanting and before the roots are reestablished. Spacing.--Spacing of tomatoes varies with the variety, soil, season in which the crop is grown, etc., but is entirely empirical and without reference to root extent. That spacing should be more distant on rich soils is not in agreement with the fact that in a well-fertilized substratum and especially in one rich in nitrogen a root system is often more concentrated. Because of the greater development of tops under such conditions, however, spacing is usually more distant. A study of the root development of different varieties on various soils should yield interesting and practical results. Fertilizers.--Fertilizing the soil should be done with a thorough understanding of its relation to root development. The common practices of drilling and mixing the fertilizer in the row or applying it broadcast and mixing it thoroughly with the soil before the plants are set seem excellent. To make a good growth before the root system is widely spread, the plants need a good supply of readily available fertilizer. Experiments have shown that where the fertilizer is applied and well mixed in the row that the production of early fruit is greatly increased. 116 In spring and early summer the root activity is greatest in the shallow soil layer which is usually moist and hence the fertilizer is available. Later the surface soil may become so dry that the roots can secure neither water nor nutrients from it except when irrigation is practiced. Thus fertilizers applied later in the season might be quite ineffective. One of the advantages of setting the plants into the field early is the greater possible use of fertilizers. Few plants respond more quickly or more profitably to a proper use of fertilizers than the tomato. Pruning.--Pruning the vines, i.e., pinching out all or nearly all of the lateral branches as soon as they appear and thus confining the growth to one or a few stems and training these remaining stems is a practice used by some growers especially in the South. 145 It has been suggested that any benefit thus derived may be due to a lessening of foliage diseases, which are more severe in the South, since trained plants are thus benefitted by better exposure to wind and sun. 157 In the North it has been largely discontinued since it has been found unprofitable. In general the yield decreases in proportion to the severity of pruning. 176, 120 For example, at Urbana, Ill., plants pruned to a single stem gave a yield of 6.5 pounds of marketable fruit; those pruned to 2 stems yielded 10.5 pounds; those with three stems 12.1 pounds; but plants not pruned gave a yield of 19.6 pounds. 95 Indeed, hundreds of pruning experiments have been done without reference to the effect upon the root system. There is a close correlation between root and shoot development and the maintenance of a proper balance between them is of very great importance. If either is too limited or too great in extent, the other will not thrive. Unpublished studies at Cornell University show that the root system of a pruned tomato plant is reduced in about the same proportion as the top. "Hence it seems probable that pruned plants suffer more from drought than unpruned plants because the former cannot get as much of the available moisture as the latter." 157 This is further indicated by the fact that blossom-end rot is nearly always more severe on trained and pruned than on unpruned plants. The divergent effect of crops on those which follow seems not to be attributable, at least principally, to differences in the amount of nutrients removed by the crops grown previously; that is, the smallest yield may not occur after the crop which removed the largest amount of even the most-needed nutrient. The soil acidity was affected differently by the several crops and, generally, the best yields of the onion, a plant which is sensitive to conditions accompanying acidity, followed the crops giving rise to the least acidity. These indications assume added importance because of the observed fact that the effects of the crops on those which follow were much less divergent if the soil acidity was reduced by liming.